A poster summarizing CASE scientific and training rationales can be downloaded here. 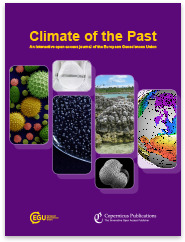 A CASE dedicated Special Issue is scheduled in Climate of the Past, an interactive open access journal of the European Geosciences Union. Title: "The changing Arctic and Subarctic environment: proxy- and model-based reconstructions of Holocene climate variability in the northern North Atlantic"
Publications and Communications listed are related to CASE's research and authored by CASE members. Publications and Communications about research not funded directly by CASE appear with an asterics. Faust, J., Knies, J., Milzer, G., Giraudeau, J., 2014. The Holocene, DOI: 10.1177/0959683614544052. Oxygen and carbon isotope composition of modern planktic foraminifera and near-surface waters in the Fram Strait (Arctic Ocean) – A case-study. Oxygen and carbon isotope composition of modern planktic foraminifera and near-surface waters in the Fram Strait (Arctic Ocean) – A case-study. Read more … Oxygen and carbon isotope composition of modern planktic foraminifera and near-surface waters in the Fram Strait (Arctic Ocean) – A case-study. Davies, F.J., Renssen, H., Goosse, H., 2014. Climate Dynamics, 42, 2099-2112. M. Alonso-Garcia, J.T. Andrews, S.T. Belt, P. Cabedo-Sanz, D. Darby, and J. Jaeger. 2013. The Holocene. C.V. Dylmer, J. Giraudeau, V. Hanquiez, and K. Husum. 2015. Deep-Sea Research I, 98, 1-9. M. M. Telesiński, R. F. Spielhagen, and H. A. Bauch; 2014. Clim. Past, 10, 123-136. I. Pathirana, J. Knies, M. Felix, and U. Mann. 2013. Clim. Past, 10, 569-587. S. M. P. Berben, K. Husum, P. Cabedo-Sanz, and S. T. Belt. 2014. Clim. Past, 10,181-198. D. E. Groot, S. Aagaard-Sørensen, and K. Husum. 2014. Clim. Past,10, 51-62. M. Blaschek and H. Renssen. 2013. Clim. Past, 9, 2651-2667. Simon T. Belt, Thomas A. Brown, Ashleigh E. Ringrose, Patricia Cabedo-Sanz, Christopher J. Mundy, Michel Gosselin, Michel Poulin. 2013. Organic Geochemistry 62 (2013) 33–45. Late Holocene changes in the Greenland Sea – local or regional phenomenon? Late Holocene changes in the Greenland Sea – local or regional phenomenon? Read more … Late Holocene changes in the Greenland Sea – local or regional phenomenon? M. Telesinski, R. Spielhagen. EGU General Assembly 2013; Vienna, Austria; 7-12 April 2013. Long-term variations in Iceland–Scotland overflow strength during the Holocene. Long-term variations in Iceland–Scotland overflow strength during the Holocene. D. J. R. Thornalley, M. Blaschek, F. J. Davies, S. Praetorius, D. W. Oppo, J. F. McManus, I. R. Hall, H. Kleiven, H. Renssen, and I. N. McCave. 2013. Clim. Past; 9, 2073–2084. Read more … Long-term variations in Iceland–Scotland overflow strength during the Holocene. G. Milzer, J. Giraudeau, J. Faust, J. Knies, F. Eynaud, and C. Rühlemann; 2013. Biogeosciences, 10, 4433-4448. C. V. Dylmer, J. Giraudeau, F. Eynaud, K. Husum, and A. De Vernal. 2013. Clim. Past., 9, 1505-1518. Sub-centennial Holocene fluctuations of Atlantic water inflow and sea ice distribution in the western Barents Sea, European Arctic. Sub-centennial Holocene fluctuations of Atlantic water inflow and sea ice distribution in the western Barents Sea, European Arctic. S. Berben, K. Husum, P. Cabedo Sanz, S. Belt; 4th Open Science Meeting; Goa; India; 11-16 February 2013. Read more … Sub-centennial Holocene fluctuations of Atlantic water inflow and sea ice distribution in the western Barents Sea, European Arctic. S. Berben, T. Furevik; 4th Open Science Meeting; Goa; India; 11-16 February 2013. T. Pados, R. Spielhagen; 4th Open Science Meeting; Goa; India; 11-16 February 2013. G. Milzer, J.Giraudeau, S. Schmidt, J. Faust, J. Knies, F. Eynaud, C. Rühlemann. 2013. PAGES 2nd Young Scientists Meeting & 4th Open Science Meeting; Goa; India; 11-16 February 2013. Mapping recent sea ice conditions in the Barents Sea using the proxy biomarker IP25: implications for palaeo sea ice reconstructions. Mapping recent sea ice conditions in the Barents Sea using the proxy biomarker IP25: implications for palaeo sea ice reconstructions. Read more … Mapping recent sea ice conditions in the Barents Sea using the proxy biomarker IP25: implications for palaeo sea ice reconstructions. F.J. Davies, H. Goosse, and H. Renssen. 2012. EGU General Assembly 2012; Vienna, Austria; 23-27 April 2012. M. Blaschek, H. Renssen. 2012. EGU General Assembly 2012; Vienna, Austria; 23-27 April 2012. The Influence of Greenland melt water on the temporal and spatial response of the Holocene Thermal Maximum in the Nordic Seas: a modelling study. The Influence of Greenland melt water on the temporal and spatial response of the Holocene Thermal Maximum in the Nordic Seas: a modelling study. Read more … The Influence of Greenland melt water on the temporal and spatial response of the Holocene Thermal Maximum in the Nordic Seas: a modelling study. T. Pados and R. F. Spielhagen. 2012. EGU General Assembly 2012; Vienna, Austria; 23-27 April 2012. S. Berben, K. Husum, and M. Hald. 2012. EGU General Assembly 2012; Vienna, Austria; 23-27 April 2012. P. Cabedo Sanz, A. Navarro Rodriguez, S.T. Belt, T.A. Brown, J. Knies, K. Husum, J. Giraudeau, and J. Andrews. 2012. EGU General Assembly 2012; Vienna, Austria; 23-27 April 2012.. 2012. EGU General Assembly 2012; Vienna, Austria; 23-27 April 2012. A. Navarro Rodriguez, P. Cabedo Sanz, S. Belt, T. Brown, J. Knies, K. Husum, and J. Giraudeau. 2012. EGU General Assembly 2012; Vienna, Austria; 23-27 April 2012. M. M. Telesinski and R. F. Spielhagen. 2012. EGU General Assembly 2012; Vienna, Austria; 23-27 April 2012. Holocene intermediate and bottom water mass reconstructions of the western Barents Sea. Holocene intermediate and bottom water mass reconstructions of the western Barents Sea. D.E. Groot, S. Aagaard Sørensen, K. Husum, and M. Hald. 2012. EGU General Assembly 2012; Vienna, Austria; 23-27 April 2012. Read more … Holocene intermediate and bottom water mass reconstructions of the western Barents Sea. J.C. Faust, J. Knies, J. Giraudeau, and G. Milzer. 2012. EGU General Assembly 2012; Vienna, Austria; 23-27 April 2012. Historic surface water productivity changes in the Barents Sea. Historic surface water productivity changes in the Barents Sea. I. Maier, M. Felix, J. Knies, and U. Mann. 2012. EGU General Assembly 2012; Vienna, Austria; 23-27 April 2012. Read more … Historic surface water productivity changes in the Barents Sea. C. Dylmer, J. Giraudeau, F. Eynaud, A. de Vernal, J. Knies, K. Husum, and S. Belt. 2012. EGU General Assembly 2012; Vienna, Austria; 23-27 April 2012. Benthic Foraminiferal Stable Isotope and Dinocyst Assemblages in Sediments of the Trondheimfjord Area (Mid-Norway): Proxies for Regional Oceanographic and Climate Changes? Benthic Foraminiferal Stable Isotope and Dinocyst Assemblages in Sediments of the Trondheimfjord Area (Mid-Norway): Proxies for Regional Oceanographic and Climate Changes? G. Milzer, J. Giraudeau, J. Faust, J. Knies, F. Eynaud, S. Schmidt, and C. Rühlemann. 2012. EGU General Assembly 2012; Vienna, Austria; 23-27 April 2012. Read more … Benthic Foraminiferal Stable Isotope and Dinocyst Assemblages in Sediments of the Trondheimfjord Area (Mid-Norway): Proxies for Regional Oceanographic and Climate Changes? D.E. Groot, S. Aagaard Sørensen, K. Husum, and M. Hald. 2012. ResClim General Assembly 2012. Bergen-Tromsø, Norway, 19-23 March 2012. S. T. Belt, T. A. Brown, A. Navarro Rodriguez, P. Cabedo Sanz, A. Tonkin and R. Ingle. 2012. Analytical Methods, 4: 705-713. Simon Belt, Thomas Brown, Patricia Cabedo Sanz, Alba Navarro Rodriguez. 2012. Environmental Chemistry Letters, 10: 189-192. Calibration and application of the IP25 biomarker for Arctic sea ice reconstructions. Calibration and application of the IP25 biomarker for Arctic sea ice reconstructions. P. Cabedo Sanz, S. Belt, T. Brown, A. Navarro Rodriguez. 2011. Biogeochemistry Research Centre Conference 2011; Plymouth, UK; 9th December 2011. Read more … Calibration and application of the IP25 biomarker for Arctic sea ice reconstructions. Analysis of the sea ice biomarker IP25 in marine sediments from Nordic Seas – a calibration study. Analysis of the sea ice biomarker IP25 in marine sediments from Nordic Seas – a calibration study. A. Navarro Rodriguez, S. Belt, T. Brown, P. Cabedo Sanz. 2011. Biogeochemistry Research Centre Conference 2011; Plymouth, UK; 9th December 2011. Read more … Analysis of the sea ice biomarker IP25 in marine sediments from Nordic Seas – a calibration study. Atlantic Water Advection to the Northern North Atlantic: an Historical View from Marine Sediments in the Western Barents Sea and Fram Strait. Atlantic Water Advection to the Northern North Atlantic: an Historical View from Marine Sediments in the Western Barents Sea and Fram Strait. Read more … Atlantic Water Advection to the Northern North Atlantic: an Historical View from Marine Sediments in the Western Barents Sea and Fram Strait. The Changing Arctic and Subarctic Environment (CASE) : a european network on marine biotic indicators of recent climate changes in the Nordic seas and adjacent domains. The Changing Arctic and Subarctic Environment (CASE) : a european network on marine biotic indicators of recent climate changes in the Nordic seas and adjacent domains. I. Dème, J. Giraudeau, S. Belt, M. Hald, K. Husum, J. Knies, H. Renssen, R. Spielhagen. 2011. AGU Fall Meeting 2011; San Francisco, USA; 5-8 December 2011. Read more … The Changing Arctic and Subarctic Environment (CASE) : a european network on marine biotic indicators of recent climate changes in the Nordic seas and adjacent domains. Holocene water mass reconstructions of the high latitude North Atlantic. Holocene water mass reconstructions of the high latitude North Atlantic. S. Berben, D.E. Groot, K. Husum, M. Hald, J. Giraudeau, J. Knies, N. Koc, S. Korsun. 2011. ResClim General Assembly 2011; Bergen, Norway; 28 March - 1 April 2011. Read more … Holocene water mass reconstructions of the high latitude North Atlantic. Holocene (sub)-surface water mass reconstructions of the high latitude North Atlantic. Holocene (sub)-surface water mass reconstructions of the high latitude North Atlantic. S. Berben, K. Husum, M. Hald, J. Giraudeau, N. Koc. 2011. ACDC 2011; Friday Harbour, USA; 30 August - 11 September 2011. Read more … Holocene (sub)-surface water mass reconstructions of the high latitude North Atlantic. *Are coccolithophores major contributors to the production and sedimentation of biogenic carbonates in the Nordic Seas : a paleo(Holocene) perspective. *Are coccolithophores major contributors to the production and sedimentation of biogenic carbonates in the Nordic Seas : a paleo(Holocene) perspective. Read more … *Are coccolithophores major contributors to the production and sedimentation of biogenic carbonates in the Nordic Seas : a paleo(Holocene) perspective.